This looks disgusting, but it's actually delicious! It's just shortbread cookies topped with almonds and a little bit of red dessert sauce. The hardest part is getting the shape right, and adding in the authentic finger lines. But if you can pull it off, then this will be one grossly yummy snack! Halloween cupcakes are one of the most creative treats to make. The smooth, rounded surfaces makes for a great palette, and there are endless options available online. Rather than provide an exhaustive list, we decided to feature these cupcakes that are to die for! We're not entirely sure how they made the little knives on top, our guess is that they took some card stock, cut it shape, and threw some icing on top. Of course, an all edible version would be perfect, so if you have any ideas how to do this, please let us know! 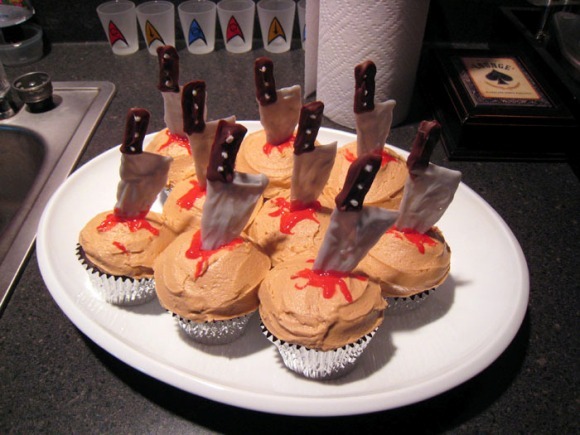 If you're not much of a baker, then these vampire cupcakes are for you. 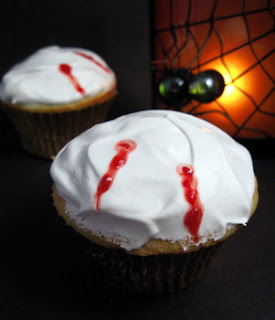 We like this cupcake style because it's simple, a little creepy, and a little artsy. Plus they're super simple to make: all you need is vanilla icing and some red gel, and voilà! You have your own mini Edward Cullen, sorta. Halloween doesn't have to only be about candy! 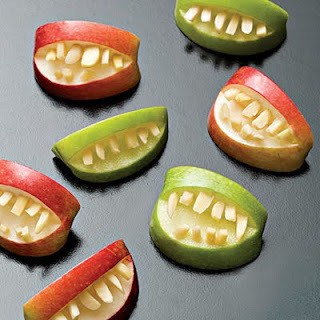 Check out these creepy teeth made from healthy and delicious apples! All you need is a half a dozen apples, a sharp knife, and maybe some lemon juice to keep it looking fresh. On second thought, the apple turning brown will make it that much creepier! 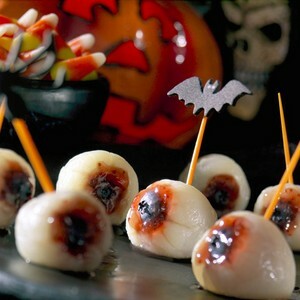 There are many ways to make creepy eyeball snacks (cupcakes, deviled eggs, fresh mozzarella) but we love how squish and slimy these lichee eyeballs look! They're pretty easy to make, you just need some fresh lichees, strawberry jam, and blueberries. Of course, we're not sure how many of your guests will want to actually eat these... they look a little too real. 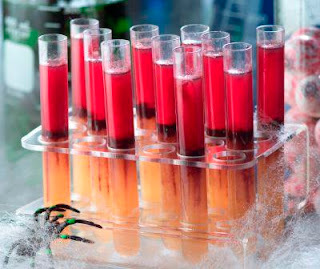 Another simple, but very festive option, are these blood test tube shots. Fill them with anything you want, fruit punch, jello shots, what have you, and throw in some little gummy spiders to add some extra spook to it. 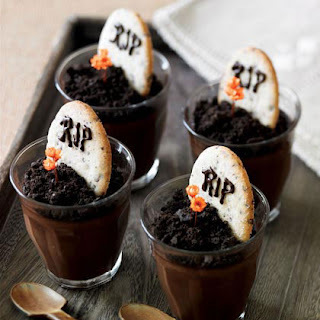 These tombstone pudding cups are very detailed, but require very few ingredients! You just need some dark chocolate pudding, cookie crumbs, cookies, and some chocolate icing. The little flowers are a good touch, but if you're feeling especially morbid, you can also throw in some little skeleton hands! Lethargic - Thanks for the comment and nice work! That's a great idea - maybe we'll give it a shot next year! We’re not in no doubt how loads of of your company will feel like to in point of fact have these...help with college term paper!!!!! Oh, My God... 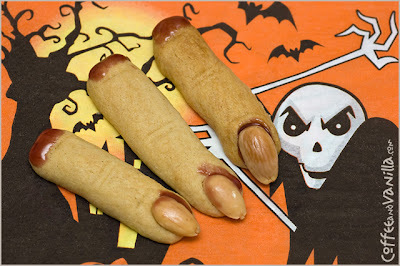 I wouldn't eat them even if they are very detailed, but require very few ingredients! I highly recommend to utilize the best term paper service for any academic needs! Good luck ! Keep it up!